Road Less Travelled: Bewitched By The Beauty of Rewai Living Root Bridge! Bewitched By The Beauty of Rewai Living Root Bridge! Meghalaya is home to several Living Root Bridges and our first glimpse of it was in Rewai Village, not to be confused with the one in Cherrapunji. Though we had read a lot about the Living Root Bridges and had seen a few pictures, we were not quite prepared for the magnificent Living Roots Bridge. We climbed down steep rock cut steps and there it was- One of the best natural engineering feats by man of course with generous help of Mother Nature. Years of patience and meticulous planning has resulted in this man made Natural wonder. Running across a large water body connecting two villages is this wonderful natural bridge. The bridge and the calm waters below it are perfect for an artist to take out their paint brush and start filling colors in their canvas. A perfect place for meditating or even soul searching. The stillness and calmness around could be the best anti depressant or the perfect de-stress that one could ask for. A small hike up the hill on the other side leads you to Nohwet view point which provides beautiful views of the surrounding hills with a bamboo bridge taking us over the edge to open up scintillating views. This village is home to few families and has a school and a small church. A valuable lesson that the Khasi tribe teaches the rest of us is that we have to leave behind a sustainable and healthy Earth for our future generations. The brains behind the ingenious idea of root bridge may not have lived to enjoy the fruits but that did not stop them from creating something selflessly for the benefit of their future generations. It was an amazing once in a lifetime experience to walk on the bridge. The natural roots are so strong that for years it has been taking massive loads and ferrying people. The bridge is so awesome that we ended up trekking to the bridge again the next day crossing another village on the way. While trekking down the steep rock cut steps to get to Rewai Root Bridge, do try the organic fruits being sold on the way from the local farms. They are perfect energy boosters and of course the sweetest fruits that you would get to eat. Life here at Rewai Village is simple at the same time filled with happiness. You can see all cheerful faces around with children enjoying and playing outside with whatever makeshift stuff they can find rather than cribbing over any gadgets. The saying necessity is the mother of all inventions is so true. 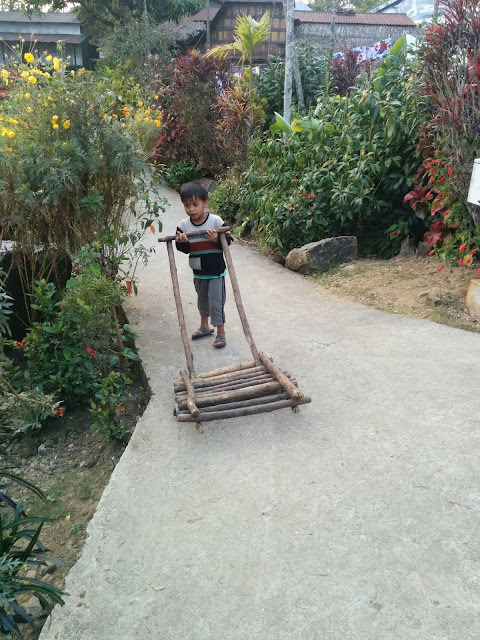 Here, we saw kids happily play with a completely deflated football, make shift trolley made of wood including the wheels. This could just be used for entertainment for the kids or could be used as a trolley to move around heavy material. It was a nostalgic feeling reminding us of our childhood where we used to gather in the colony streets and play with just mud, sand or one football. This laid back and beautiful village is self sustained and does not seem to be pressed by time. The happy villagers never seemed to be in a rush. A sense of achievement post the trek and of course stopping to admire the natural beauty surrounding you is the best joy and the perfect way to de stress. During one of our walks to the Rewai village, our legs took us to the not so explored paths that led us to a small water body and a bamboo bridge over a dry riverbed. We also came across a bamboo made bridge leading to a different path to one of the many bamboo fields hidden and definitely would not be visible from the road. Also, we came across a natural staircase made of stones and rocks- a beautiful sight. 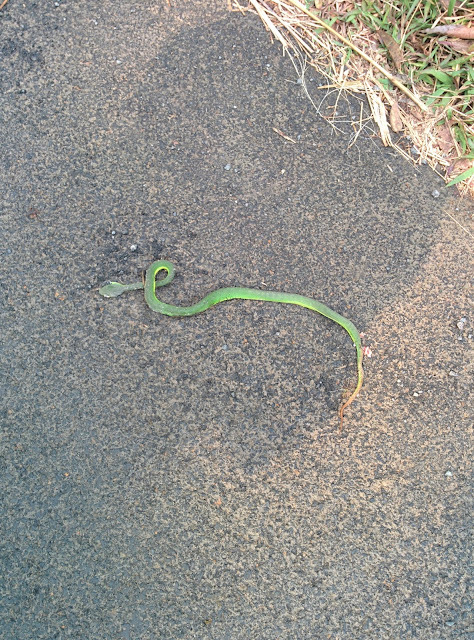 We even ended up spotting a dead snake on the road. 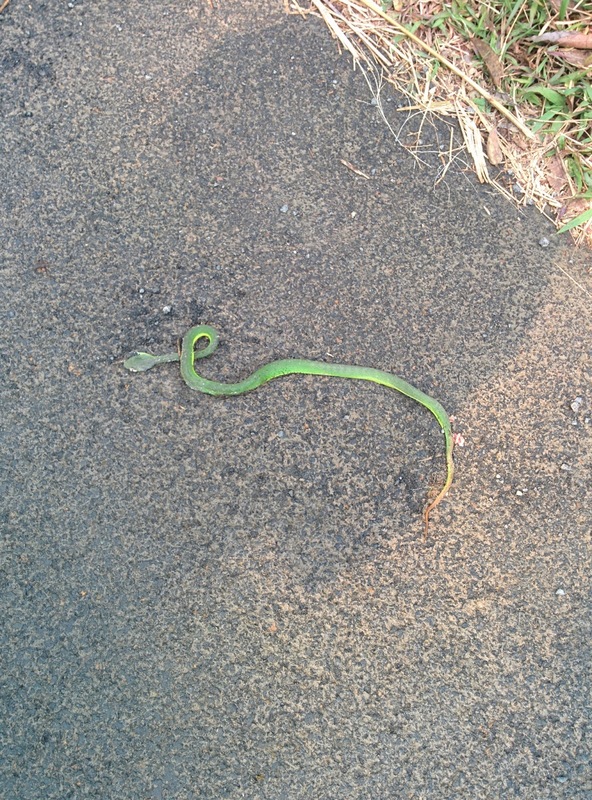 It looked like it was killed while it was trying to cross over to the other side by one of the speeding vehicles. This village is just 2 km from Mawlynnong the cleanest village in Asia. Though most of them tend to hire cars and try to club both the cleanest Village and Rewai root bridge as a day trip from Shillong, we would strongly recommend against it. Of course, to save time it would be ideal to club them as a day excursion from Shillong. However, the true essence of the village and understanding the history behind growing these bridges would be totally lost if we do not have time in hand. To do complete justice to these places, we would recommend staying over at least for 1 night at the village and visiting the Root Bridge by foot. Though the walk could be tiresome, it would be worth it as you would also cross another village Rewai- neighboring village of Mawlynnong and has taken inspiration from them to keep their surroundings clean. The charm of staying in the cleanest village makes it a perfect relaxing vacation. The icing on the cake would be the short trek to the root bridge. Your pictures itself tell how peaceful life they are leading.. thanks for this pleasant virtual tour.. Very beautiful! In the midst of nature and the bridge is made by nature. So true, so serene are the wonders of Nature. Wonderful photos and write=up about Meghalaya. We are planning a trip there Dec 9-13.